Please note that this meeting will be held at Harbour Pointe Clubhouse. Procedural comments for this meeting are offered by Manager Bailey in a cover memo to the BCA Board (see pages 2-3 of the Information Packet). Brandermill residents are encouraged to attend a community meeting to discuss the details of plans by the Holladay Corporation to redevelop the site of the former Brandermill Inn. The Holladay Corporation proposes to redevelop the property that is the site of the former Brandermill Inn as a 90-unit memory care facility. The existing building will be demolished, and the new facility will be built generally in the same location within a smaller development footprint than the existing structure. The redevelopment of the property for the proposed use will be compatible with the surrounding development and will have a positive impact on the community. Treasurer Hillman noted that the Association continues to be in good shape financially. The entire monthly report was included in the board packet. Hillman presented Gail C. Plante for membership on the Finance Committee (see pages 9-12 of October 6, 2014 BCA Board information packet). President Davis suggested that First Vice President Pearson meet with Plante prior to the BCA Board's approval. The Directors agreed, and this nomination will be reconsidered in November. Director Leonard advised the BCA Board that the issue of solar panels has come before the ARB. He advised that an HOA cannot restrict the use of solar panels unless there is a written standard, which does not current exist in our Residential Design standards. Director Leonard went on to say that Woodlake's standard simply says that their ARB will deal with solar panel applications on a case-by-case basis. He also noted that now there are solar panels which look like roofing. President Davis noted that it would be politically incorrect to ban solar panels. Community Manager Bailey reported to the BCA Board on the staffing of the newly approved committees. The ARB is full with seven members. Finance has six of seven members. The Hearing Committee has six members. The NRC board needs three Board members. The Planning committee needs all seven members. Communications needs all seven members. Manager Bailey reported on the September actions by the Property Management Department, including covenant enforcement (see pages 15-16 of October 6, 2014 BCA Board information packet). He noted that Matthew Lacey's (Deer Meadow) concerns regarding the poor appearance of Dominion Power's junction boxes has been addressed with Dominion Power and will be corrected. 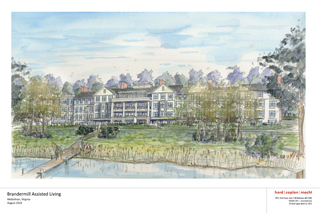 Manager Bailey noted that the Association had received an email from Brandermill Woods regarding the proposal by Holladay Corporation to construct an assisted living facility on the Brandermill Inn site. Cynthia Rivers representing Brandermill Woods addressed this issue before the BCA Board. She stated that Brandermill Woods is concerned about possible over-saturation of assisted living facilities within Brandermill and that Brandermill Woods initially understood this proposal to be for an independent living facility rather than licensed assisted living facility. President Davis asked if Holladay Corporation must not go through a planning committee process before the Central Virginia Health Planning Commission to receive a certificate of need. Director Pearson commented that there are different levels of government involved in the approval process. He noted that Brandermill will look at the design of the facility; the County, the site plan and the State, the Certificate of Need. President Davis noted that the Brandermill Inn site has been an issue for 10 years. He asked Rivers if Brandermill Woods had ever looked at the site for development. Rivers responded that they had not. Rivers commented that Brandermill Woods considers themselves to be a partner in the community and wants to be part of the planning process. She noted that Brandermill Woods is investing to expand its facilities and is concerned about possible over-saturation. Director Pearson noted that there will be four opportunities for concerned parties to have input during the planning process at various levels of the government approval process. Director Bettin noted that the Holladay Corporation bought the property in February and had just begun the process of submitting their proposal. He asked if the BCA Board has the authority to block competition. Director Pearson responded that the Central Virginia Health Planning Commission is the governmental body which will examine the issue of "need" for the services being proposed. Director Bettin noted that he thought the BCA Board should meet with Brandermill Woods. Manager Bailey next reported on the 2015 budget process. He noted that there will be a meeting at 6:30 p.m. on October 20 at the Harbour Pointe Clubhouse for community input. This will be followed by a BCA Board meeting on November 3. These meeting both provide important opportunities for public hearing and comment on the proposed 2015 budget. He noted that the October issue of The Village Mill contains detailed information comparing the 2015 and 2014 budgets, including costs for each department and the proposed 5% increase in the budget which equates to an increase of $22 per year per household. Manager Bailey noted the proposed budget adds a subscription fee to cover the cost of the printed Village Mill. He also noted that the proposed budget increase provides for the addition of three full-time employees for brush pickup. President Davis asked how many people the Maintenance Department would have with the addition of three full-time employees. Manager Bailey responded Maintenance would have a total of 10 people. He also asked how much the additional three full time employees would cost, and if total salaries would remain below 50% of the total budget. Manager Bailey responded that salaries would be 49.8% of the total budget with the addition of these employees. President Davis noted that the rate of inflation is 1.7% and asked about the justification for the proposed 3% increase in employee salaries. Manager Bailey responded that he will take that comment and question back to the Finance Committee. Director Pearson commented that Brandermill needs to perform a survey on employee salaries. He feels that it is overdue and noted that the last one was erroneous because it included salaries for the West Coast. He commented that we should look for comparisons between Woodlake and Chesterfield County. He commented that we don't know if 1.7% is right because we don't know where the market is. Director Bettin commented that he thought picking up brush is a good idea. Director Pearson, chair of the Task Force, reported that the group's fourth meeting would be held on Wednesday, October 8. He reported that the group has talked about abandoned properties and noted that Wednesday's meeting would include the BCA's attorney. He noted that the Task Force will hold two meetings in November. Director Malek asked if the Task Force has looked at condemnation as a means of dealing with abandoned properties in a timelier manner. Director Pearson responded that Brandermill can place a lien and, if necessary, foreclose. He commented that the Task Force hopes to establish some firm guidelines for these actions and would look for legal guidance from its attorney. A motion was passed unanimously to pursue these liens with a 30-day notice. Director Leonard motioned to approve the changes to signage standards as recommended by the ARB (see pages 25-27 of October 6, 2014 BCA Board information packet). President Davis asked if, due to confusion on this issue regarding different levels of government authority over placement of temporary signage on roadways versus private property, this issue should carried over to November. The BCA Board approved a motion to defer this issue by a vote of 5:2. Directors Leonard and Bettin opposed the motion to defer. Director Blom moved to grant Mr. Bhupendra Patel's request to convert the Sleep Inn & Suites - Harbour Pointe from "Public or Commercial Unit" to "Self-Maintained Public or Commercial Unit." The motion was seconded by Director Hillman and unanimously approved by the BCA Board. Director Hillman moved to establish a policy of no loans to employees by the Association, task the Finance Committee to create language for incorporating such language into the Financial Policy, create language to govern the disposal of Association assets, and to consider having an audit conducted by a third party. This motion was seconded by Director Blom and unanimously approved by the BCA Board.